Photographers, especially “serious” ones, love to talk about equipment: which is better, Canon or Nikon? Is a zoom lens as good as a fixed telephoto lens? Is it worth it to pay hundreds of dollars more for a little faster lens? Should I get the newest camera with more megapixels? This kind of talk isn’t new to the digital age. I remember impassioned arguments over whether Fuji or Kodak film was better (“You’re both wrong, it’s Ilford!”) I’m sure that argument is still going on somewhere. Perhaps you are part of another group. You like photography, but feel limited by your equipment. Maybe all you have is a camera phone, and can’t afford anything else. Maybe you have a point-and-shoot camera, or even a nice Digital Single Lens Reflex (DSLR) and wonder if you need to spend more money to take better photos. This question is as old as photography itself. But before you break open the piggy bank, consider what Henri Cartier-Bresson did. “the decisive moment.” Nearly any mention of his work references the fact that he shot almost exclusively with a 50mm lens on his 35mm film Leica. For those of you not familiar with the technical side of photography, on a 35mm camera (so named for the size of the film it used), a 50mm lens shows roughly the same field of view as human vision. For this reason it is considered the “normal” lens. However, in the same way that you cannot make your eyes zoom in to see a distant object more closely, neither can the 50mm lens. 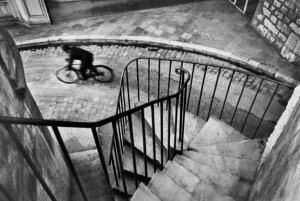 Much has been made of Henri Cartier-Bressons purity: his insistence that his images not be cropped, but printed exactly as he shot them; that there are no darkroom tricks or manipulation; and his choice of the 50mm lens, which many photographers would regard as limiting, but which Cartier-Bresson used to capture many iconic images. After hearing of this lens purity for many decades, I finally saw an interview where Cartier-Bresson addressed this topic. He laughed that people thought is was some artistic statement. The reality was, he just couldn’t afford anything else! Cartier-Bresson, like many other photographers, didn’t let his equipment limit his vision. He worked within his limitations to create the best images he could with what he had. He knew his 50mm lens would not let him capture a close-up of someone’s face from 50 feet down the street, so he incorporated the surroundings into the composition. I’m not much of a wildlife photographer, but living in Montana its not uncommon to come across beautiful wild animals, sometimes in your own yard! On an off-road ride with a friend, we came across a small herd of deer crossing in the distance. I didn’t have a telephoto lens big enough to get a close-up “portrait” of any of the animals, but I used what I had to capture this image silhouetted against the sky. 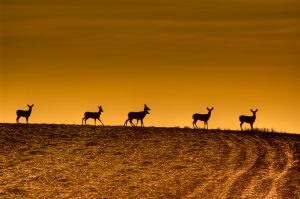 I exposed for the light of the sky, which rendered the deer in silhouette, then converted it sepia monochrome to strengthen the graphic impact. This idea of making the best with what you have applies at all levels of photography. Some photographers simply must have the latest flagship camera from their favored manufacturer. Maybe the shiny new camera makes things a little easier, or is more durable, but after a certain point there is no perceptible difference in image quality.The surest way to be disappointed with your camera is to try to make it do what it was never intended to. If you only shoot with your phone, then try to be the best damn phone-photographer there ever was. The more you shoot, the more you will learn what works and what doesn’t. If you want to shoot a close-up of wildlife from 100 yards away, then you know you’ll have to get different equipment. But don’t let that stop you from shooting the best you can with what you have. I try to avoid technical talk in this blog as much as possible. If you search online, you can find so many articles comparing cameras and image quality that it will make your head spin. So if you are in the market for a new camera, whether its part of a phone, or a point-and-shoot, or DSLR, you can stay very busy comparing features online. Whether you are happy with the camera you have, or want to get something better for your needs, don’t wait to start shooting the most amazing shots you can. Be great within your limitations! Being a better photographer doesn’t require getting a better camera. Sign up with your email address for exclusive offers, discounts, and updates. You'll be entered in a quarterly drawing to win a print of your choice. Next drawing June 30, 2018. All prints are delivered conservation matted in 20×24 inch mats, ready to frame. Conservation matting uses archival, acid free mat and backing board, hinged with acid free linen tape. The print is held in place with acid free photo corners, leaving the print free of adhesives, and allowing you freedom to change matting at any time without damaging the print. See the Samples page for more information. All prints are shipped within the domestic United States for a flat fee of $20 shipping and handling. Shipping is free for orders of two or more prints. For international orders, please email darryl@brightstudio.com for rates and information. Use of archival inks, media, and matting materials will prevent any fading with age when properly displayed. However, if your print ever fades, I will replace it free of charge, no questions asked. Just mail the print to me and I will send out a replacement.